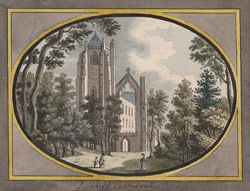 View of Dunkeld Cathedral in Scotland. A monastery was first built on this site, on the banks of the River Tay, in 730AD which was then redeveloped by Kenneth MacAlpine in 848AD and became the centre of Christianity in Scotland. Because successive Bishops added to the Cathedral buildings the architectural style is a mixture of Gothic and Norman. The cathedral complex includes a choir, a nave with two aisles, a Chapterhouse and a 96 foot heigh tower. The Cathedral was attacked during the Reformation of the 16th century and although it was largely rebuilt it was destroyed in 1689 by Jacobite troops who burnt it to the ground.